Ever since Star Wars first aired, there have been light sabers: first with just light, the electronic, now an advance on earlier versions: the spinning electronic lightsaber. Star Wars takes your imagination into the star wars universe with spinning, dual action. 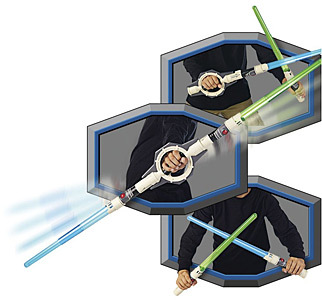 Surprise your opponents with spinning blades, or wield the lightsabers separately for two-handed action. The cyborg leader duels as well as his Jedi oponents, a master of the double-bladed light saber. Surprise those who dare oppose you with spinning blades or detach the lightsabers for two-handed action.